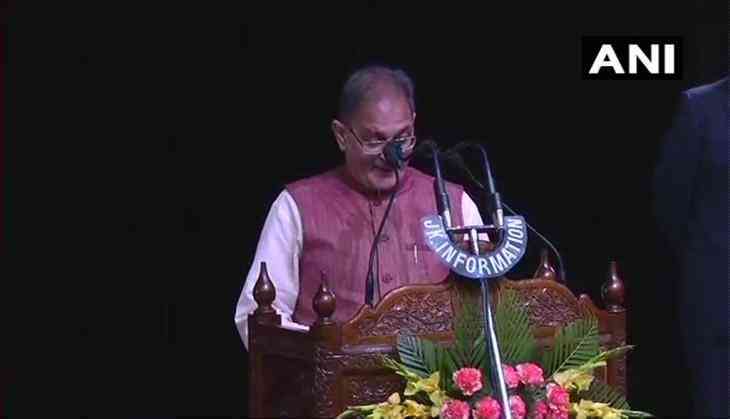 Gandhinagar MLA Kavinder Gupta on Monday took oath as the Deputy Chief Minister of Jammu and Kashmir after a major reshuffle in the cabinet. Gupta took over the post after Nirmal Singh tendered his resignation as Deputy Chief Minister of the state on Sunday. The swearing-in-ceremony of the newly inducted minister took place in noon. The event was attended by BJP national general secretary Ram Madhav and Minister of State in the PMO Jitendra Singh. Besides Gupta, other leaders who sworn in as ministers of state by Governor NN Vohra include PDP's Pulwama MLA Mohammad Khalil Band, BJP's state unit chief Sat Paul Sharma, PDP MLA from Sonwar Mohammad Ashraf Mir, BJP's Kathua MLA Rajiv Jasrotia, Sambha MLA Devinder Kumar Manyal and BJP's Doda MLA Shakti Raj. Sunil Kumar Sharma, who is at present serving as minister of state for transport, has been elevated to the rank of a cabinet minister.